The Perseid meteor shower is here! 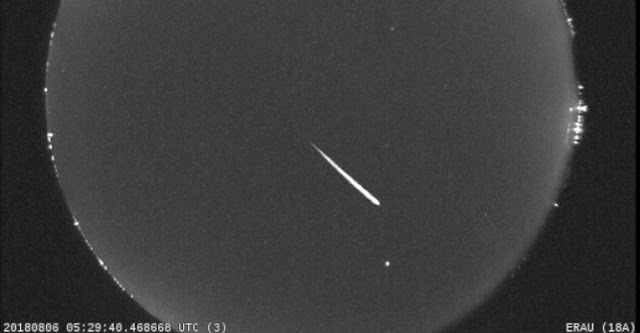 Perseid meteors, caused by debris left behind by the Comet Swift-Tuttle, began streaking across the skies in late July and will peak on August 12. The Perseid meteor shower is often considered to be one of the best meteor showers of the year due to its high rates and pleasant late-summer temperatures. This year’s shower peak, however, has the added bonus of dark skies courtesy of an early-setting crescent Moon. Combine these ideal observing conditions and high rates (an average of 60 meteors per hour at the peak) with the fact that the best nights for viewing – August 11 to 12 and August 12 to 13 – occur on a weekend and you have a recipe for successfully viewing some celestial fireworks! Make plans to stay up late or wake up early the nights of August 11 to 12 and August 12 to 13. The Perseids are best seen between about 2 a.m. your local time and dawn. If those hours seem daunting, not to worry! You can go out after dark, around 9 p.m. local time, and see Perseids. Just know that you won’t see nearly as many as you would had you gone out during the early morning hours. Why Are They Called Perseids? All meteors associated with one particular shower have similar orbits, and they all appear to come from the same place in the sky, called the radiant. Meteor showers take their name from the location of the radiant. The Perseid radiant is in the constellation Perseus. Similarly, the Geminid meteor shower, observed each December, is named for a radiant in the constellation Gemini. If it’s not cloudy, pick an observing spot away from bright lights, lay on your back, and look up! You don’t need any special equipment to view the Perseids – just your eyes. (Note that telescopes or binoculars are not recommended.) Meteors can generally be seen all over the sky so don’t worry about looking in any particular direction. While observing this month, not all of the meteors you’ll see belong to the Perseid meteor shower. Some are sporadic background meteors. And some are from other weaker showers also active right now, including the Alpha Capricornids, the Southern Delta Aquariids, and the Kappa Cygnids. How can you tell if you’ve seen a Perseid? If you see a meteor try to trace it backwards. If you end up in the constellation Perseus, there’s a good chance you’ve seen a Perseid. If finding constellations isn’t your forte, then note that Perseids are some of the fastest meteors you’ll see! Pro tip: Remember to let your eyes become adjusted to the dark (it takes about 30 minutes) – you’ll see more meteors that way. Try to stay off of your phone too, as looking at devices with bright screens will negatively affect your night vision and hence reduce the number of meteors you see!